The final episode in my summer series of podcasts featuring the work of guest poets is a masterpiece by the Master Gardener himself, the inimitable Mr. Walt Wojtanik. The poem is called “Tides”. My regular programme of recordings of my own work returns next week but I shall still be featuring a guest poet on the last Friday of each month from October to June, when once again I hope to have a summer series lined up. 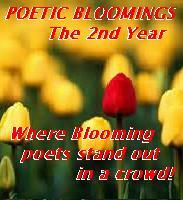 This entry was posted in podcasts, Poetic Bloomings, Poetry and tagged #Tides. Bookmark the permalink.